Advance Electronic Tech provides expert TV repair in Jacksonville FL , Jacksonville Beaches and Ponte Vedra Beach, we will take care most of the TV repair problems during the first visit to your home or business, all of our TV repair Jacksonville FL will carry a six-month warranty on new parts . We specialize in Samsung, LG, Sony, Mitsubishi, Panasonic & Vizio TVs. We also offer TV repair for any TV technology, including LCD, LED, 4K, HDTV, DLP, 3DTV, Projection, and Plasma. Our primary focus is to repair your TV at the component level instead of choosing the simpler but more expensive route of replacing the whole circuit board. This saves you time AND money! Find out more on our FAQ page. We also keep a large inventory of TV repair parts in our trucks. We also provide insurance estimates (call for details). We have been fixing TVs throughout Jacksonville for more than 20 years now and have received nothing but praise from our loyal customers. Read our reviews here! The set is getting no power. The set clicks on and off. The picture is washout dark or not picture at all. The screen is showing whites or black dots. The HDMI or others inputs are not working. The tv lamp light or service message is on. You see a steady or blinking error light. The set has audio but no picture. No picture after a loud pop noise or burning smell. TV damage by lighting or power surge. 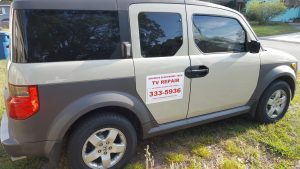 We offer TV repair near you! We can work with you to schedule a visit at a time that is most convenient for you. On the scheduled day of service, we will give you a confirmation call-back and arrival-time estimate just before we show up. Also if you call our office before 10AM, we will do the best to schedule the service call on the same day you request your TV repair. If you would like more information about our prices and availability to service your television, please give us a call at 904-333-5936 and we will promptly answer all of your questions. Copyright © 2015. Advance Electronic Tech. All Rights Reserved.